Tag folders and files (including multimedia) by dragging the tags on them, you can create tags of various shapes and colors for a more intuitive classification. Precise search possibilities, with various input fields, allowing to add all the necessary tags that you want. 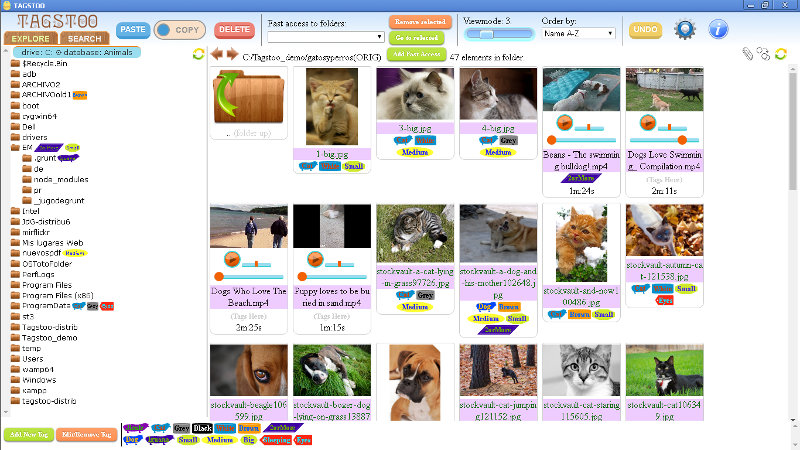 For example, in one field you can add the tags cat and white and in another field you can add the tags dog and brown, so the search result will return all white cats and brown dogs. Another more abstract example to show the available searches can be: Searh under folders that have (tag50) or (tag51 + tag52) files that have (tag1 + tag2 + tag7 + tag8) or (tag1 + tag2 + tag6 + tag9) but don't have (tag10) and (tag11). Multimedia files preview in both explorer and searcher results cards. The cover images of epubs also are shown. Usual file management actions by dragging and dropping or pressing buttons; copy, move, delete, rename. And undo button. It's possible to export/import the tagging data to a file, so data is available in any computer. - Tag Folders and files easily by dragging and dropping tags created from a variety of shapes. - No installation required. Compatible with Windows, Linux and Mac OS. - Export/import data to a file. - Possible to build up very specific searches. - Various Viewmodes; from lists to cards of different sizes to preview folders and files. - Multimedia file preview in explorer/searcher. Also Epubs. - Integrated image viewer that can be launched alternatively to the system's default viewer. - Tags positions are interchangeable. - You can combine between COLOR, GREY, DAY and NIGHT modes to change interface colors to best fit your like. This page was last modified on 12 April 2019, at 18:23.